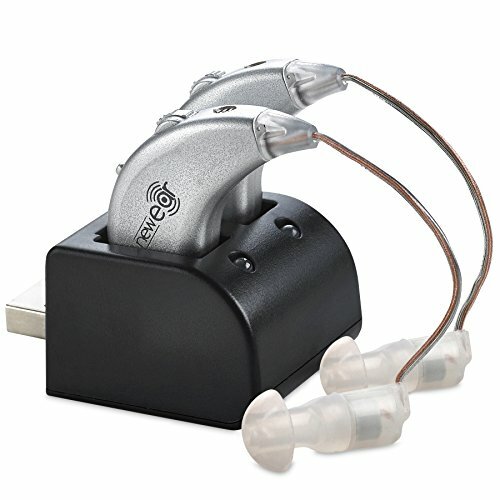 Have You Been Searching For A Rechargeable High Quality Behind The Ear Digital Personal Hearing Amplifier? NewEar would like to share this amazing news with you. The NewEar rechargeable hearing amplifier is the most popular behind the ear sound amplification device for speech frequencies of the human voice with its complete background noise reduction and cancellation technology. Intelligently designed, the NewEar BTE digital hearing amplifier is compact, lightweight, discreet and durable in design making this the the ideal hearing solution for you to instantly experience higher quality sound the way it is intended. With so many digital advancements today - you will want the latest technology when it comes to your hearing for the most crystal clear sounds. Our digital hearing amplifiers are practically invisible and very light weight for a remarkable industry leading standards. The Perfect Easy Charge & Go Battery Designer to Last All Day On A Single Charge! Why Wait!? Take advantage of this amazing deal, just click the "Add to Cart" button above and order yours today! EXPERIENCE A PREMIUM DIGITAL HEARING AMPLIFIER: At a fraction of the cost. With the NewEar digital hearing amplifier you experience clear sound amplification with digital noise reduction and sound processing. Making the NewEar rechargeable hearing amplifier the best in sound amplification for speech frequencies of the human voice with complete background noise reduction and cancellation. ALL NEW DIGITAL TECHNOLOGY ELIMINATES STATIC & UNWANTED NOISE: With the NewEar BTE hearing amplifiers say goodbye to static, fuzz, humming or unwanted sounds. With the revolutionary digital hearing technology you will experience sounds the way they were meant to be. Highly advanced mini micro processor technology makes this pair a superior hearing amplifier. RECHARGEABLE TECHNOLOGY THAT LASTS ALL DAY: Time to upgrade your hearing amplifiers and forget about always running out or changing batteries. Now the NewEar Energy efficient rechargeable batteries gives you longer battery life and use between charges.Without changing batteries all the time you will be free to do the things you love. PRECISELY SMALL AND LIGHTWEIGHT: It's so comfortable you may even forget your wearing it. The small compact design fits hidden away behind the ear. They are also comfortable to wear with any pair of glasses. It's designed by our most experienced audiologist by considering all the liable requirements of an individual for best results. SIMPLE. EASY. READY TO USE RIGHT OUT OF THE BOX: With the our latest digital smart chip technology no programming is required. The best hearing amplifier that precisely boosts the frequencies associated with the human voice.